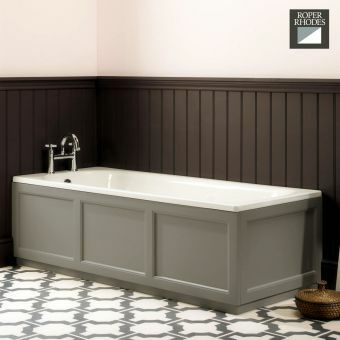 Roper Rhodes bath panels are smart and effective methods of finishing off the recessed bath tub, giving it a professional finish that looks great in the family home, hotel suite or guest house setting. Created with attractive panels, the Valencia, Hampton and 800 Series panels are high quality, affordable options that are adaptable to a wide range of bath tubs. Supplied in standard sizes, Hampton bath panels come in an array of gorgeous colours. As a prestigious design house that prides themselves on their ability to create exciting and innovative products, the Roper Rhodes Smartflow Bath Filler will find much appeal among the creative customer. Combining the water outlet with the overflow, they eliminate the need for traditional taps and mixers to create a streamlined, minimalist space. When activated they produce a pleasant and surprising cascade of water. For the creative designer, these options provide ample scope to assemble your own special bathing space at an affordable price. The Smartflow range combines practicality and functionality with sleek and gorgeous aesthetic design, with a top-of-the-range waterproof finish. Fill your bath without the need for conventional taps using these multi-funtional fillers which also combine a conventional overfow with a clicker waste to seal the bath plug for filling. Roper Rhodes pair exceptional practical features with a number of aesthetic choices in order to find the best possible fit for you and your family. The Smartflow Round Bath Filler offers practicality and efficiency with beautiful minimalist and undeniably contemporary design. The Smartflow Square Bath Filler offers an unconventional alternative to traditional bathroom plumbing. Instead of following the expected system of mixers and tabs, the Smartflow Filler combines water flow with overflow in order to reduce wasted water. A push click waste controls management of used water. 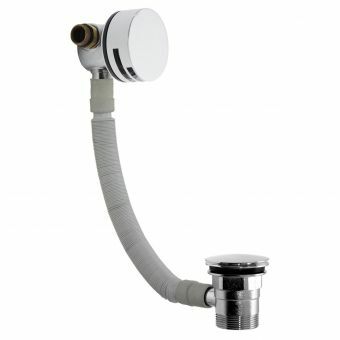 A control valve of some sort is necessary to control the flow and temperature of the water arriving into the bath and the most viable option for this is simply using a conventional shower valve. This outstanding technical design is housed within a sleek and compact chrome fitting, which is available in square or round options. This is a unique and contemporary bathroom accessory which will help you to utilise your use of water in the best possible way for cost effectiveness and to preserve the environment, as well as encompassing a striking and stylish piece of minimalist design. The Smartflow Round Bath Filler offers all of the benefits of the Smartflow Square Bath Filler in an alternative design shape. The Hampton range includes the stunning Hampton bath panels. Using muted colours and hand-crafted materials, the bath panels are designed for use with inset baths to conceal pipework and to give your bathroom a sleek and sophisticated finish. The panels are made from wood and measure 1695 x 500mm with a height adjustable plinth. The panels are available in two tasteful colours, mocha and vanilla, in order to provide you with the best fit for your colour scheme. The panels are designed for use with other Roper Rhodes furniture items, which can be found in corresponding styles and colours for a seamless decor and stylish simplicity in your home. For baths that require corner installation, an optional end panel is also available, measuring 685 x 500mm. 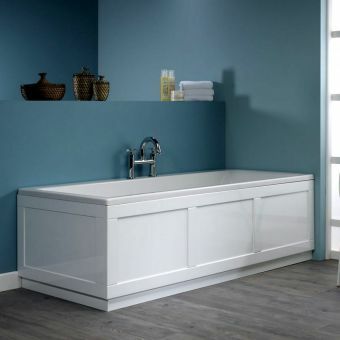 Another item in The Hampton Range that would make a fitting accompaniment to your Hampton Bath Panels would be the Hampton Cloakroom Unit with Basin. Available in matching colours with a similar sophisticated and elegant design, this unit will create a sense of cohesion and impeccable taste in your home. Roper Rhodes also offer a range of toilet units and bathroom mirrors in the classic Hampton colours and finish, to ensure that your aesthetic vision can be applied to every aspect of your bathroom design. The 800 Series Bath Panel is a quick, easy and sophisticated solution for your bathroom. Available in front and end panels with an adjustable plinth ranging between 450mm and 590mm, the 800 Series Panel can be used within any aesthetic design or colour scheme. The 800 Series Panel is set with a striking rectangular shape and is available with a white gloss finish. It looks stunning when paired with any of the furniture or accessories from the Roper Rhodes range, and works particularly well with Smartflow products. There is also a range of unconventional and exceptionally functional shower fittings, such as the Roper Rhodes Shower System 1 and the Roper Rhodes Shower System 2, which fit seamlessly with the Smartflow theme. You can mix and match between styles and ranges in order to create a bathroom that is unique to you and your individual needs and preferences. Also designed to be used with the Hampton range, the Valencia Bath Panel is finished so effortlessly and stylishly that it can function as a key piece within a contemporary or more traditional bathroom. Featuring inset rectangular design in a clean, white finish, the Valencia Bath Panel adds a touch of sophistication to your bathroom, whatever your taste. It is provided with an adjustable plinth with a range of 430 to 560mm and is designed to be used in conjunction with other pieces from the Valencia range. Due to the simplicity and versatility of the Valencia Bath Panel, it also looks great when paired with other Smartflow products for a striking and simple bathroom aesthetic. Roper Rhodes provide exceptional examples of technical design, as well as stunning accessories such as their range of LED and illuminated mirrors and bathroom cabinets so that you can build a bathroom that all of your friends and family will envy and admire. You can combine items from the Hampton, Smartflow and Valencia ranges, as well as taps and mixers and toilet fittings from the Elate, Storm, Stream and countless other ranges to create an aesthetic that reflects your unique and personal taste. Do you have a large or a small bathroom? Is it a conventional or unconventional shape? If your bathroom has small nooks and crannies it is useful to consider the ways in which you can create the illusion of space in your home, especially if you intend to include a bath. For example, a smaller bathroom would benefit from Roper Rhodes bath panels with the size adjustable and end panel options. If you have a larger space, a free-standing bath would help to fill the room and make it look spacious and stylish. Do you live alone or with a partner? Do you have or are you planning to have children? A bathroom has to be used every day for a long time, so it is important to consider your individual needs. If you are a couple or have young children, it might be a good idea to install a larger bath although the standard sized bath of 1700 x 70mm wide should be suffoicient for most people's needs. A Roper Rhodes Freestanding Vanity Unit or other cabinet styles would serve as practical storage place to keep unsightly shampoos, shower gels and toothbrushes safe and out of view. Move away from using the edges of the bath from being your storage area and de-clutter your bathroom. It is also worth considering your individual lifestyle. Perhaps you have lots of time to relax at home and to maintain and clean your bathroom, or perhaps you lead a very busy work or family life, leaving little time for maintenance. For those who have limited time at home, practical and easy-clean products are perfect, such as the sleek Roper Rhodes Cirrus 900 wall mounted unit and matching basin. However, for those who prefer to luxuriate at home and value comfort as a top priority, the flexibility and range of sizes within the Roper Rhodes bath panel range means that you can plan your bathroom around the size of a large and accommodating bathtub. Of course, your individual budget must also be considered. The Roper Rhodes items and accessories come in a range of different prices so that you can combine products to build a bathroom that is both beautiful and affordable. There are mid-range and higher-range products for those who want to ooze style and sophistication, but it is also possible to create your vision on a budget using only Roper Rhodes own bathroom products. The stunning technical design of the Roper Rhodes products means that they are very easy to maintain. 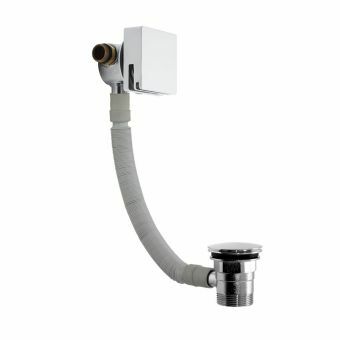 They all come with parts guarantee so that you can rest safe in the knowledge that your new bathroom fitting will continue to fulfil a reliable, stylish and relaxing function in your home for years to come. 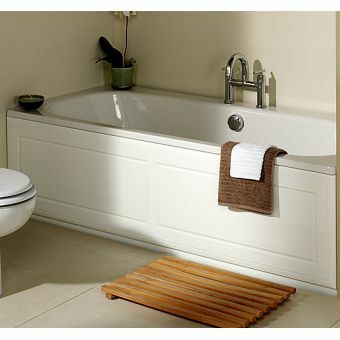 If you have any questions about which Roper Rhodes bath to choose, why not contact us at UK Bathrooms today. We'd be happy to offer our expert advice.